You'll never want regular toast ever again. 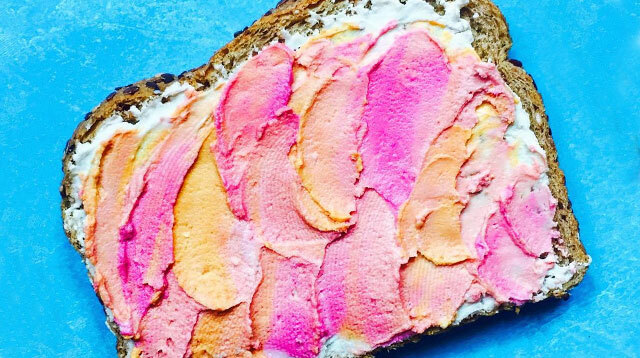 The most beautiful toast on Instagram is called—but of course—unicorn toast. Food photographer and stylist Adeline Waugh, 26, first created the colorful pastel toast and initially tagged it with #ToastTheRainbow, but commenters quickly dubbed it unicorn toast. To make the magical toast, Adeline covers bread in colorful spreads made from almond milk, cream cheese, and natural pigments like beet juice, turmeric root, and freeze dried blueberry powder. "It looks pretty, but it just tastes like a piece of toast with cream cheese," Adeline tells Cosmopolitan.com. Her Instagram handle is @vibrantandpure and, unsurprisingly, her food creations are just that. Adeline says that she likes to use toast as a canvas and "paint" it with custom pastel spreads topped with other food. Regardless of being the Queen of Toast, she also creates smoothies, desserts, and more substantial meals. As talented as she is, Adeline hasn't always been a food artist and stylist. Based in Miami, she was working as a conference planner and taking holistic nutrition classes on the side when she realized her passion was food photography. And in just one year, she's been able to turn that passion into her career. "After endless practice and really honing in on my own aesthetic, companies started reaching out to me to style, photograph, and create for them," she told Cosmopolitan.com. Pretty damn impressive. If you're really into unicorn toast, Adeline insists that anyone can make it. She says you just have to use a variety of bright colors and if you're looking to take an Instagram that gets ~all~ of the likes, be sure to photograph the finished product in natural light. Hi, every brunch place ever, please switch to strictly unicorn toast.